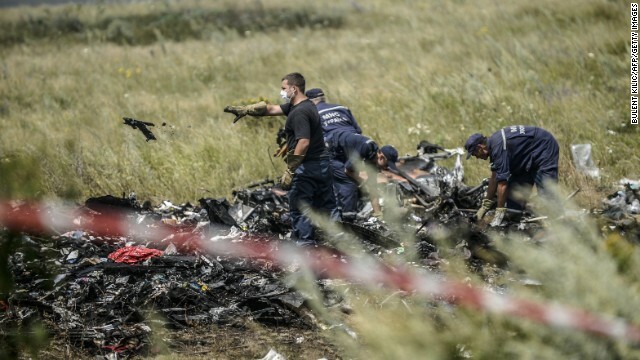 Is MH17 disaster a result of tragic blunder? 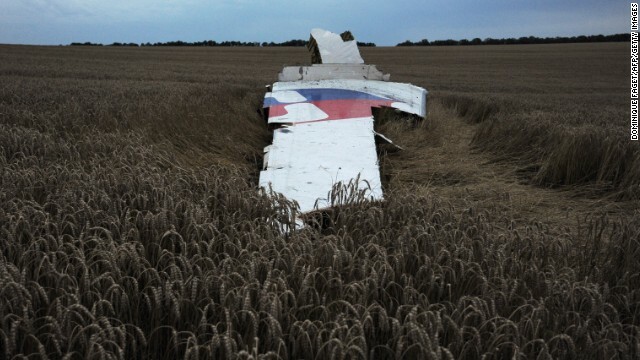 Debris from Malaysia Airlines Flight 17 sits in a field at the crash site in Hrabove, Ukraine, on Tuesday, September 9. 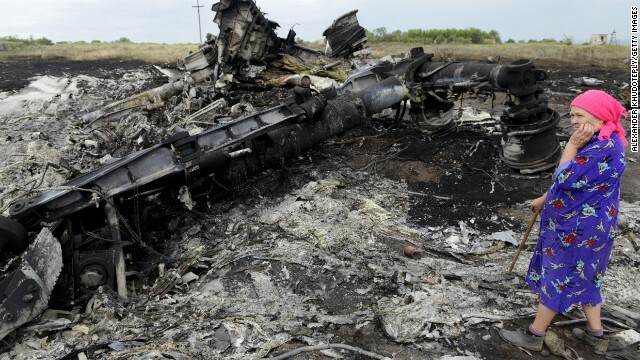 The Boeing 777 is believed to have been shot down July 17 in an area of eastern Ukraine controlled by pro-Russian rebels. 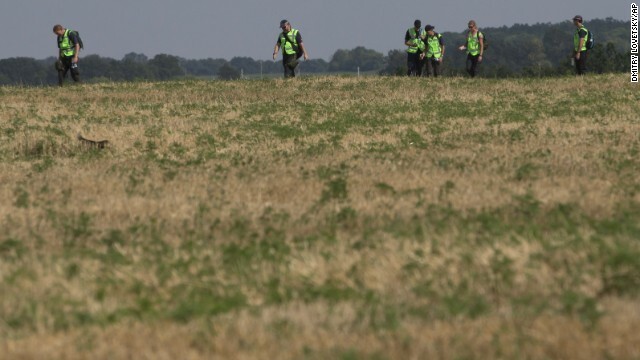 Australian and Dutch experts examine the area of the crash on Sunday, August 3. 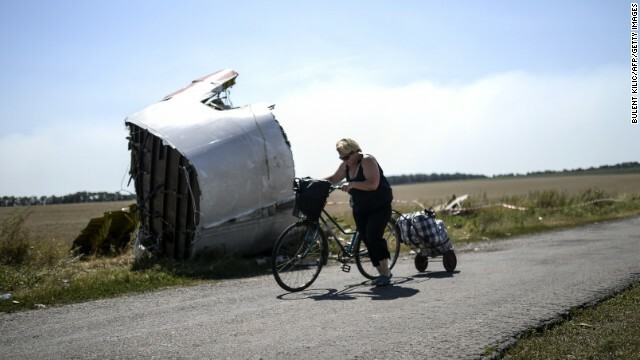 A woman walks with her bicycle near the crash site on Saturday, August 2. 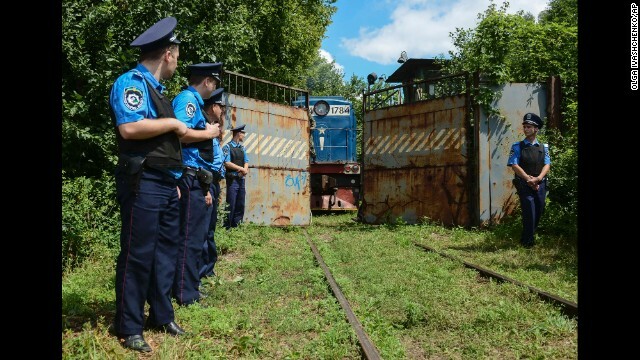 Police secure a refrigerated train loaded with bodies of passengers from Malaysia Airlines Flight 17 as it arrives in a Kharkiv, Ukraine, factory on Tuesday, July 22. 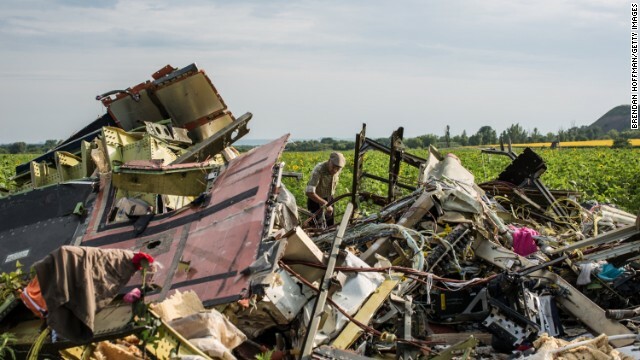 A pro-Russian rebel passes wreckage from the crashed jet near Hrabove on Monday, July 21. 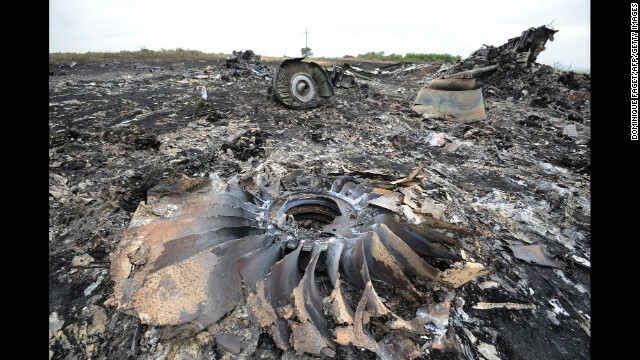 Wreckage from the jet lies in grass near Hrabove on July 21. 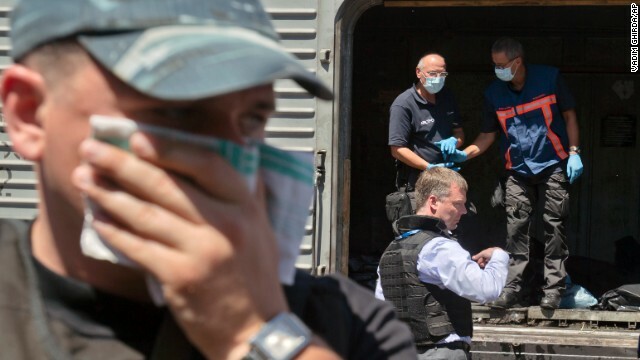 A man covers his face with a rag as members of the Organization for Security and Co-operation in Europe and the Dutch National Forensic Investigations Team inspect bodies in a refrigerated train near the crash site in eastern Ukraine on July 21. Emergency workers carry a victim's body in a bag at the crash site on July 21. 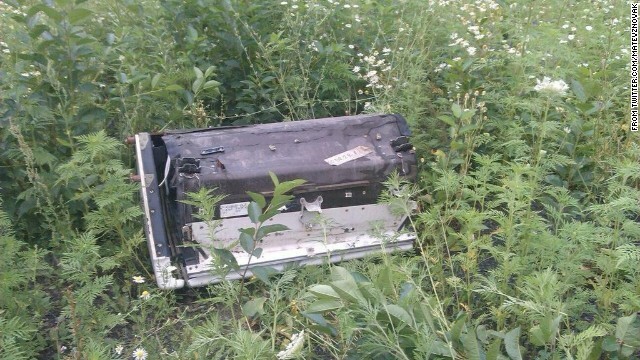 A piece of the plane lies in the grass in eastern Ukraine's Donetsk region on July 21. 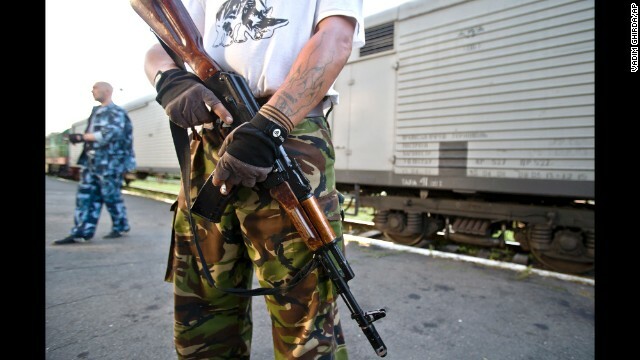 An armed pro-Russian rebel stands guard next to a refrigerated train loaded with bodies in Torez, Ukraine, on Sunday, July 20. 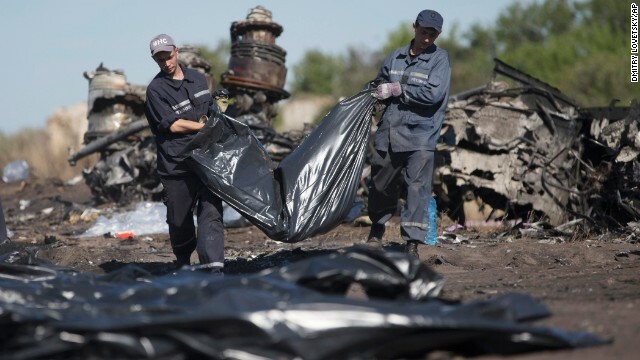 Ukrainian State Emergency Service employees sort through debris on July 20 as they work to locate the deceased. 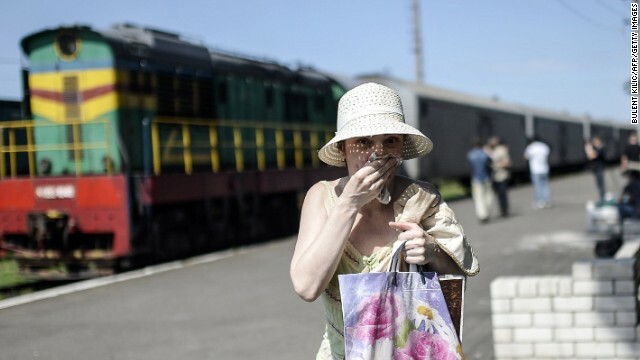 A woman covers her mouth with a piece of fabric July 20 to ward off smells from railway cars that reportedly contained passengers' bodies. 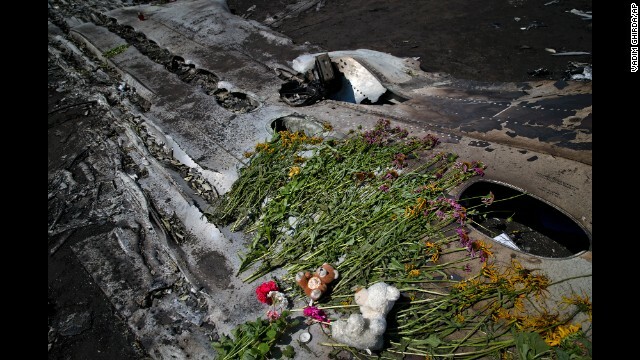 Toys and flowers sit on the charred fuselage of the jet as a memorial on July 20. 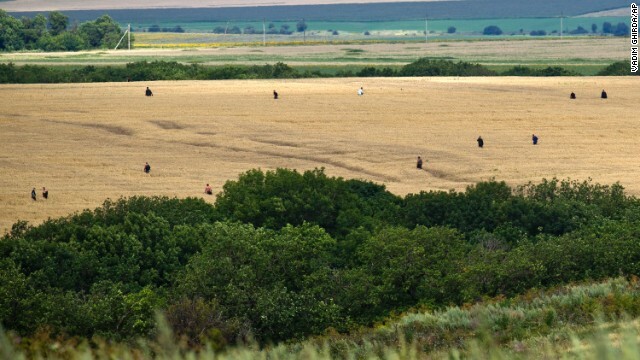 People search a wheat field for remains in the area of the crash site on July 20. A woman walks among charred debris at the crash site on July 20. Emergency workers load the body of a victim onto a truck at the crash site on Saturday, July 19. 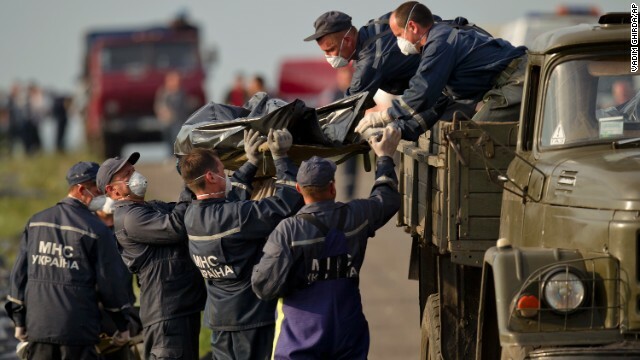 Emergency workers carry the body of a victim at the crash site on July 19. 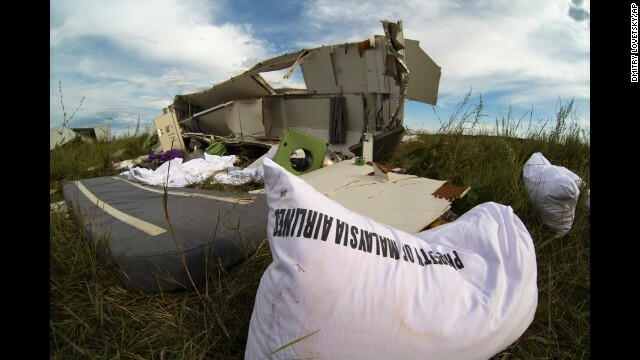 A large piece of the main cabin is under guard at the crash site on July 19. 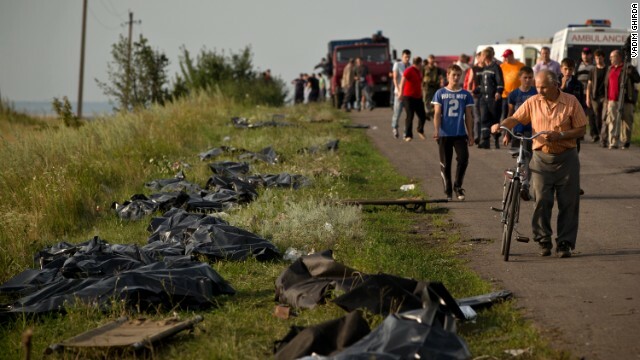 Victims' bodies are placed by the side of the road on July 19 as recovery efforts continue at the crash site. International officials lament the lack of a secured perimeter. 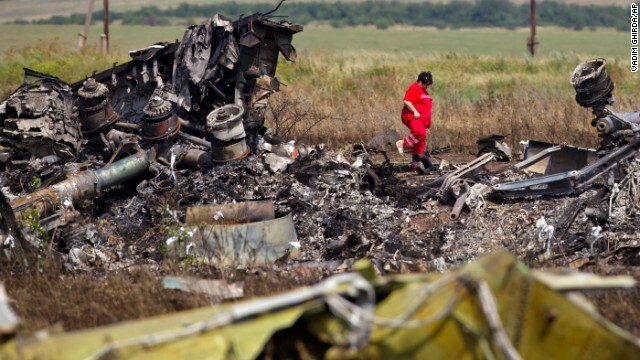 A man looks through the debris at the crash site on July 19. 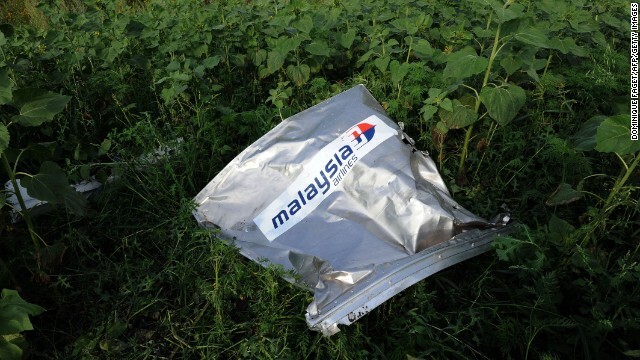 An envelope bearing the Malaysia Airlines logo is seen at the crash site on July 19. 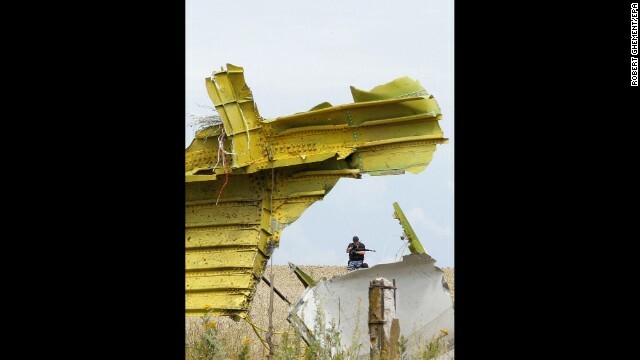 Armed rebels walk past large pieces of the Boeing 777 on July 19. 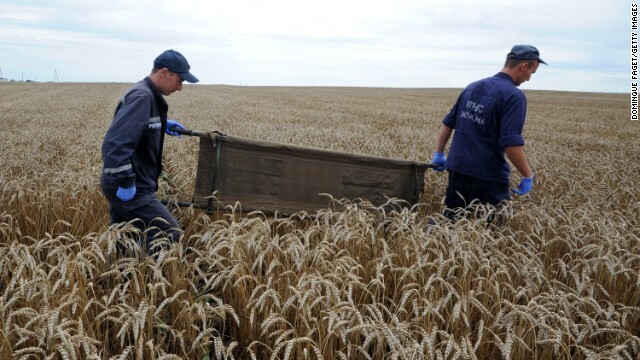 Ukrainian rescue workers walk through a wheat field with a stretcher as they collect the bodies of victims on July 19. 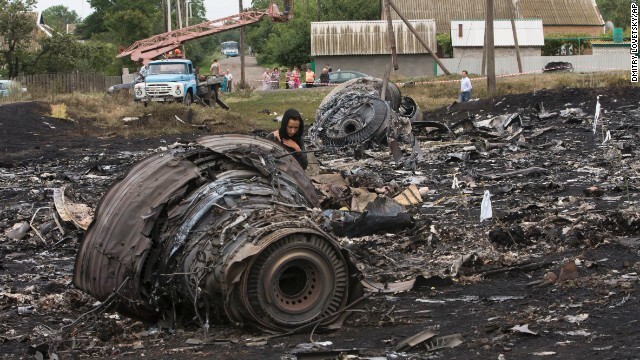 A woman looks at wreckage on July 19. 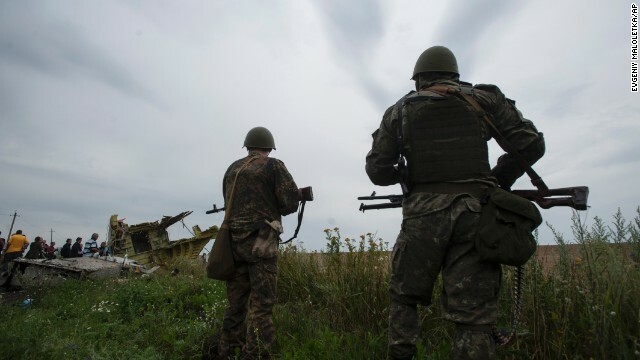 Pro-Russian rebels stand guard as the Organization for Security and Co-operation in Europe delegation arrives at the crash site on Friday, July 18. A woman walks through the debris field on July 18. 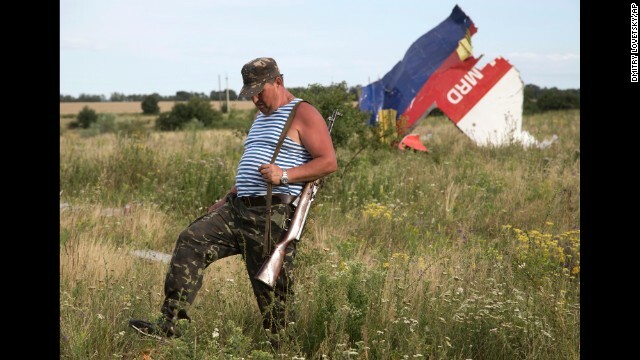 Pro-Russian rebels stand guard at the crash site. 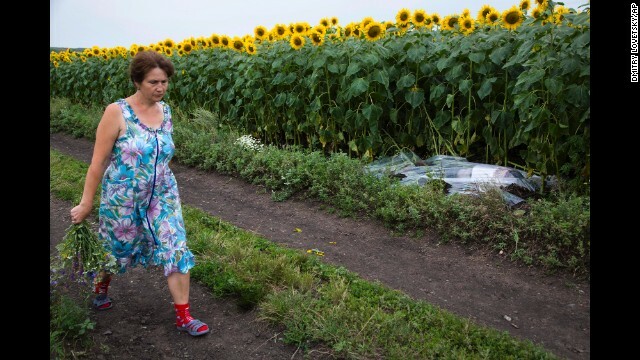 Wreckage from Flight 17 lies in a field in Shaktarsk, Ukraine, on July 18. 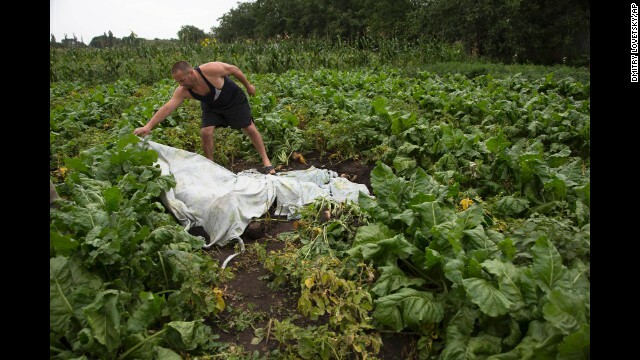 A man covers a body with a plastic sheet near the crash site on July 18. The passengers and crew hailed from all over the world, including Australia, Indonesia, Malaysia, Germany and Canada. 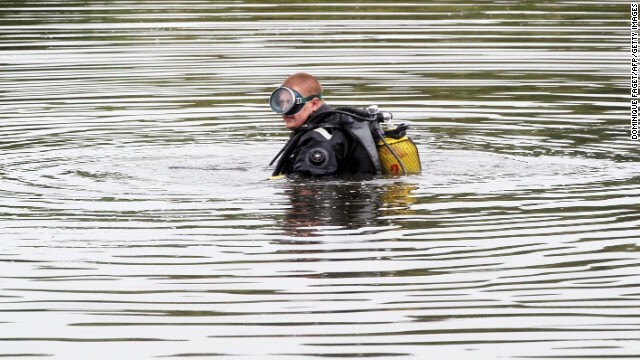 A diver searches for the jet's flight data recorders on July 18. Coal miners search the crash site. 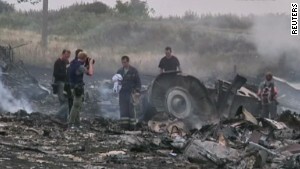 Wreckage from the Boeing 777 lies on the ground July 18. 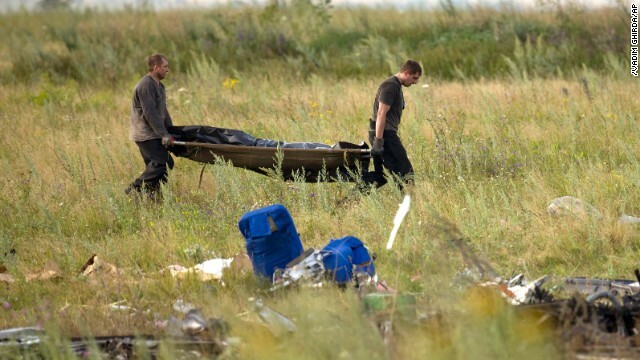 People search for bodies of passengers on July 18. 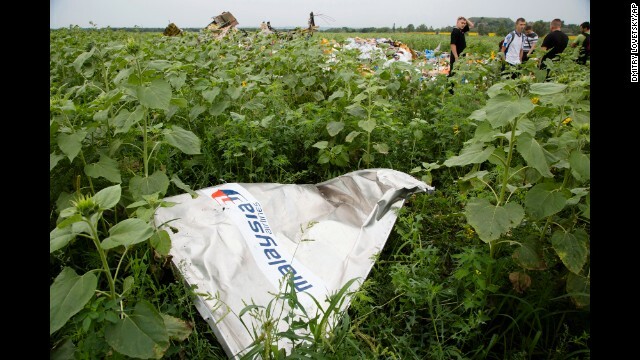 A woman walks past a body covered with a plastic sheet near the crash site July 18. 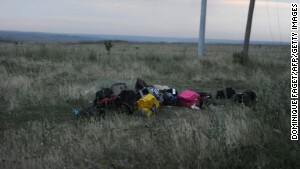 Belongings of passengers lie in the grass on July 18. 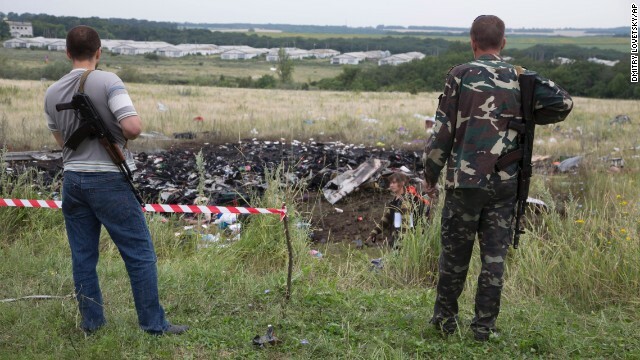 People inspect the crash site on Thursday, July 17. People walk amid the debris at the site of the crash. 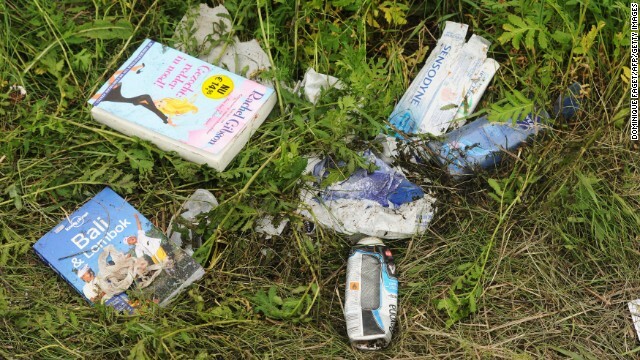 Debris smoulders in a field near the Russian border. Fire engines arrive at the crash site. A man stands next to wreckage. 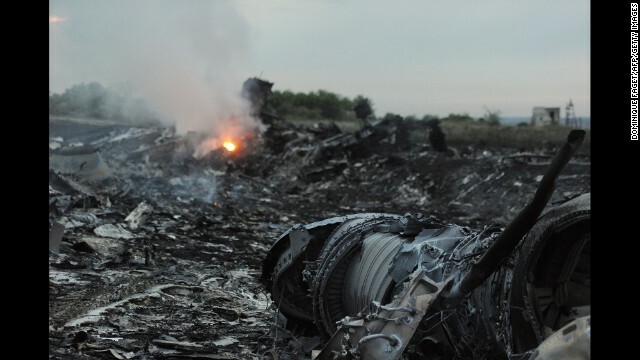 Debris from the crashed jet lies in a field in Ukraine. 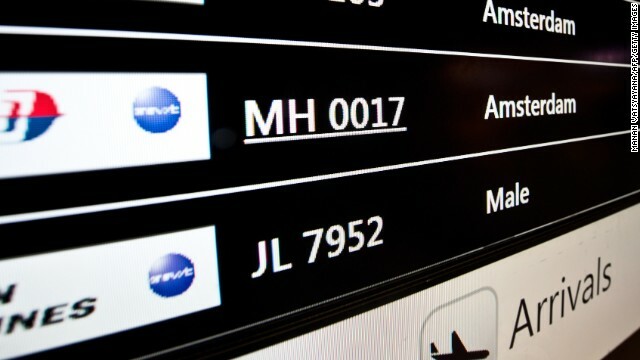 Family members of those aboard Flight 17 leave Schiphol Airport near Amsterdam, Netherlands. 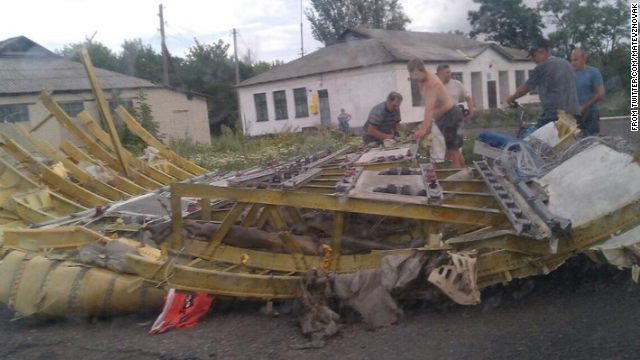 A large piece of the plane lies on the ground. 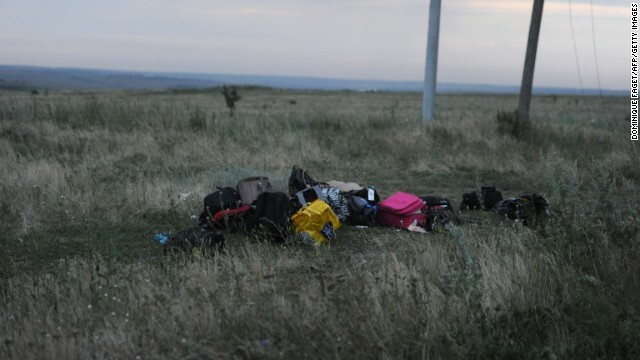 Luggage from the flight sits in a field at the crash site. A couple walks to the location at Schiphol Airport where more information would be given regarding the flight. Flight arrivals are listed at the Kuala Lumpur International Airport in Sepang, Malaysia. 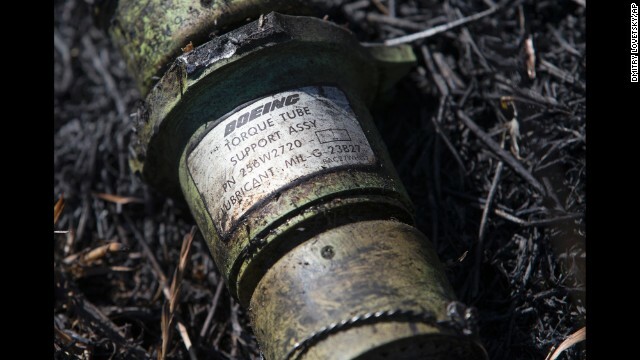 Debris from the Boeing 777, pictured on July 17. 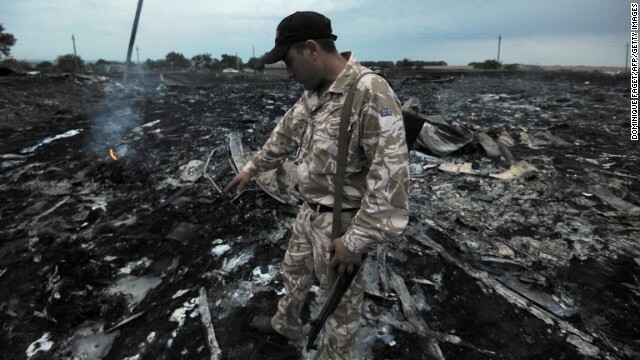 A man inspects debris from the plane. 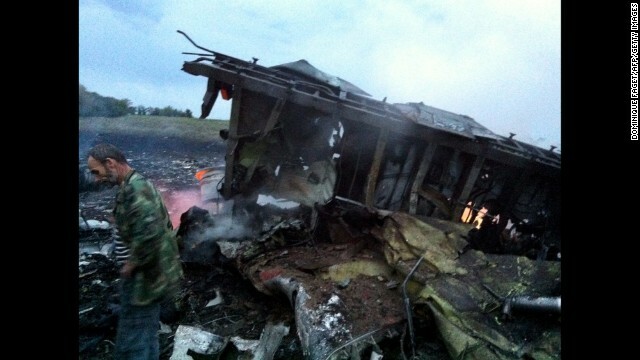 Wreckage from the plane is seen on July 17. 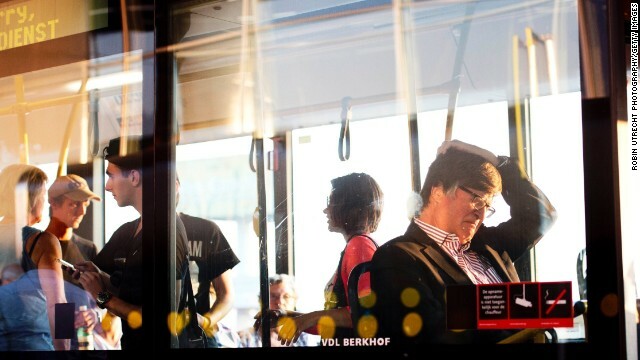 A man talks with security at Schiphol Airport on July 17. 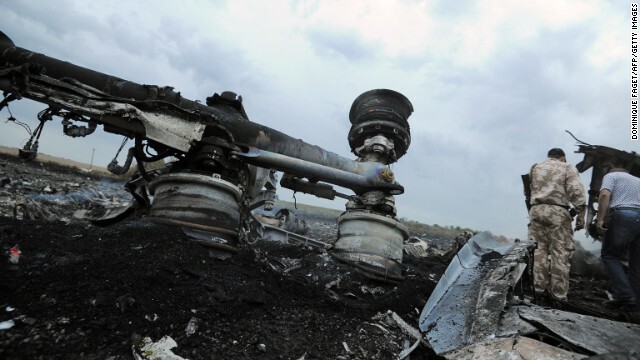 A man stands next to the wreckage of the airliner. 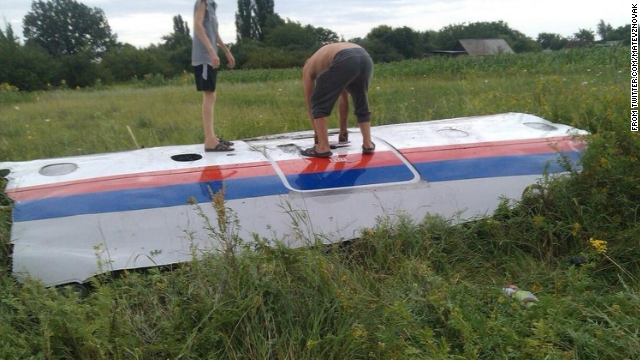 People inspect a piece of wreckage believed to be from Malaysia Airlines Flight 17. This image was posted to Twitter. 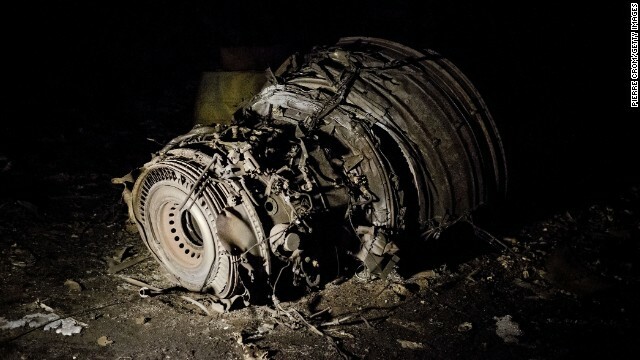 A piece of wreckage believed to be from Malaysia Airlines Flight 17. This image was posted to Twitter. 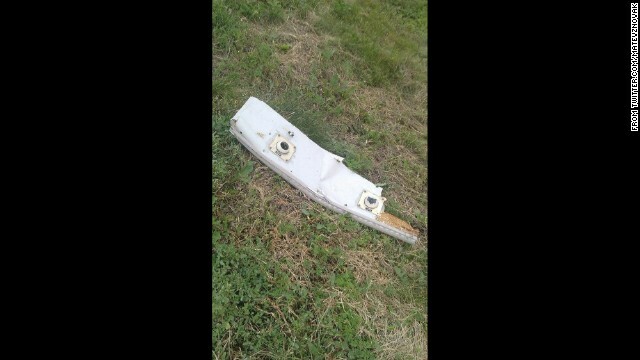 A piece of wreckage believed to be from MH17. This image was posted to Twitter. 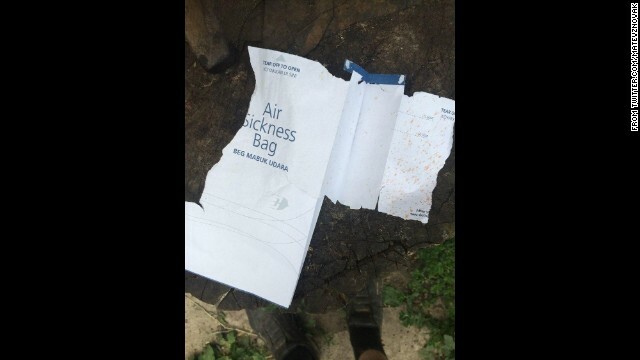 An airsickness bag believed to be from MH17. This image was posted to Twitter. Editor's note: Michael Desch is a professor and chairman of the political science department at the University of Notre Dame. He specializes in international security and American foreign and defense policies. The opinions expressed in this commentary are solely those of the author. 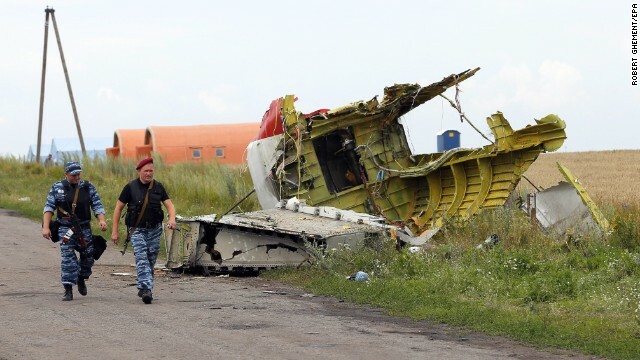 (CNN) -- In the last few days, two Ukrainian warplanes were brought down over Eastern Ukraine (one allegedly by a Russian jet) and on Thursday a Malaysia Airlines passenger plane crashed in the area, apparently with the loss of all 298 souls on board. 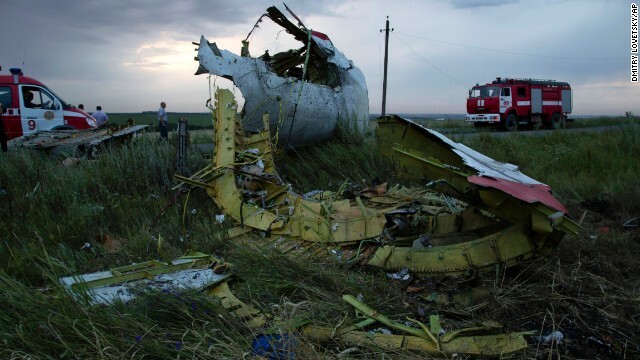 If it turns out that the unfortunate civilian airliner was also shot down, Russia and its local allies could again be implicated. Understandably, the international community will wonder whether this portends an escalation in the Kremlin ambitions there. Vice President Joe Biden is already sure he knows what happened, telling an audience in Detroit on Thursday that the plane has "been shot down, not an accident. Blown out of the sky." 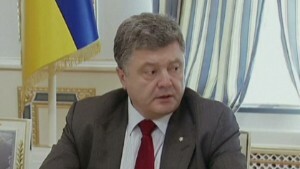 Ukrainian President Petro Poroshenko calls this "an act of terrorism" and is pointing the rhetorical finger at Moscow. 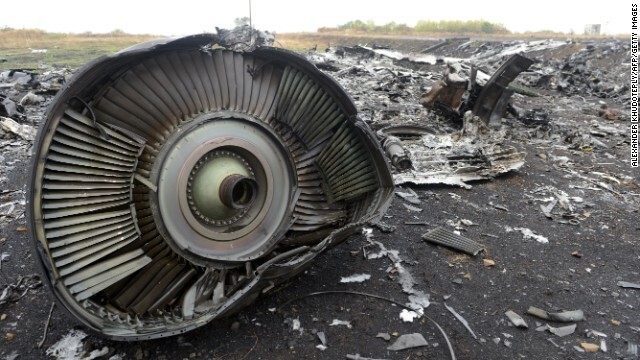 While all the facts are not yet in, it is indeed possible that a Russian surface-to-air missile brought the civilian plane down. 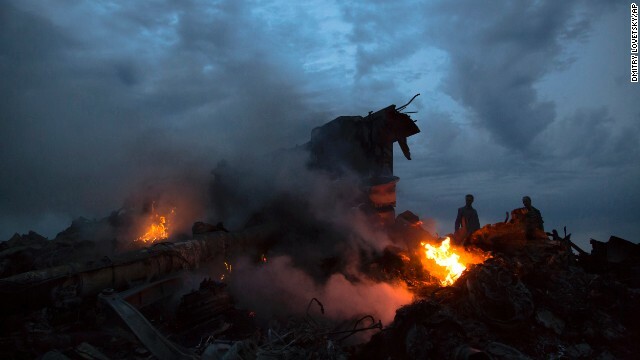 If so, Russia or its Ukrainian separatist allies bear heavy responsibility for this tragedy. But that would not indicate that Russian President Vladimir Putin's overall strategy in the region has changed. 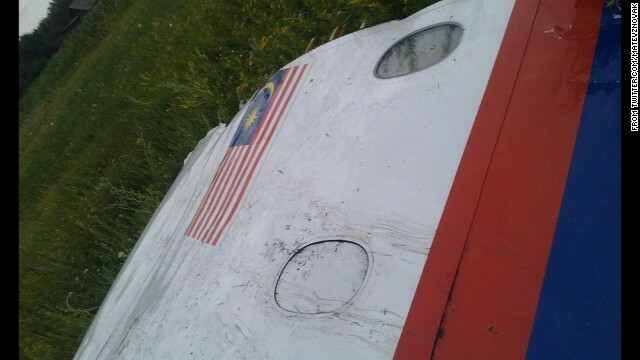 If a Russian missile did bring down MH17, it is likely that it was the result of a tragic error, a case of mistaken identity, rather than an intentional act by either the Russian military or their Ukrainian separatist allies. Such accidents are sadly not unprecedented. In 1983, Soviet Air Defense Forces tracking an American electronic reconnaissance plane operating near their naval facilities on the Kamchatka Peninsula mistakenly shot down Korean Airlines Flight 007 with the loss of 269 passengers, including a hard-line anticommunist U.S. congressman. And during the Tanker War in the Persian Gulf in 1988, a U.S. Navy AEGIS cruiser -- the USS Vincennes -- mistook Iran Air Flight 655 for an attacking Iranian warplane and shot it down, killing 290 civilians. 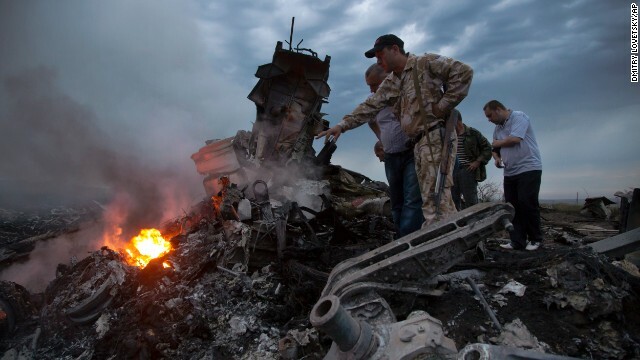 Such tragic accidents happen in wartime or periods of heightened international tensions. If it turns out that this is what happened in this case, the Russian military and their Ukrainian allies will suffer a well-deserved black eye. 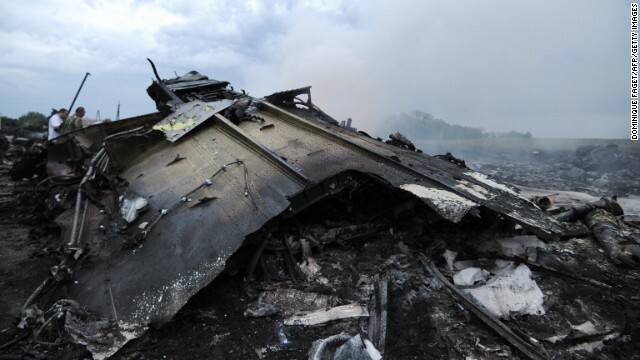 The Russian Air Defense Forces ought to have been able to distinguish a civilian airliner, operating on a previously filed flight plan and with its electronic identification systems operating, from Ukrainian warplanes. 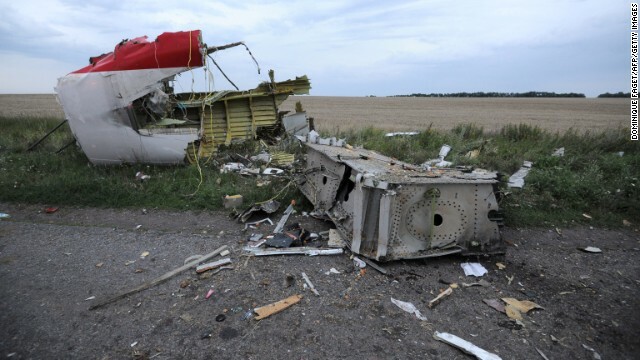 If they gave a high-altitude system to the Ukrainian separatists, then they also should have anticipated that an accident like this could have happened given that the Donetsk Republic has only primitive radar systems. But there is blame to go around. 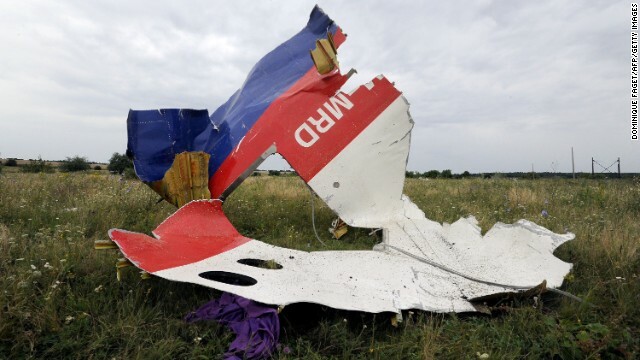 Why did MH17's flight path take it right over a war zone in which two warplanes had just been shot down? 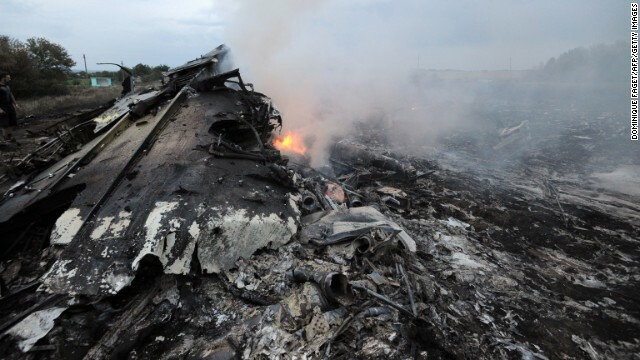 You have to wonder what the airline and the Ukrainian and Russian civilian air controllers were thinking. Even if events transpired as Biden and Poroshenko surmise, it's unlikely to indicate any major change in the Kremlin's ambitions in Eastern Ukraine. There is no evidence that Putin has deviated from his strategy of keeping the pot boiling in the region and begun moving toward something more ambitious. Indeed, all the evidence suggests that he understands that the Donetsk Republic is not the Crimea. The best he can hope for is to use the pro-Russian insurgency as a lever to pry Kiev out of its increasingly Western orientation and as a bargaining chip with the new Ukrainian regime to get it to adopt a more federal political system that will keep Ukraine suspended between East and West. This is, of course, a cold-blooded Machiavellian strategy of realpolitik. But such a cynical approach to the Eastern Ukraine is not incompatible with this event being nothing more than a tragic blunder.